If you get up early enough, and you should, the streets of Havana are quiet and void of activity. And then, as you roam the vacant streets with dawn approaching, you’ll encounter small groups on their way to work, or to catch a ride, or to catch the bus, or to get a cup of coffee. It is during these early hours that you’ll likely find little vignettes such as this one. Of course I was drawn to the wonderful red car with tons of character, but then the door opened and the woman poked her head out. Then she stepped out, obviously waiting for her ride. An already good image now a better one. And then, after she left, a neighbor stepped out of his home and shared that the car was his and did not run. It too is waiting, waiting for another talented, industrious Cuban to come and fix it, so it will ride again. I’d like to draw your attention to a very special new tour that Dan and I are offering in January of 2016. A full week at The Hideout Dude Ranch in Wyoming! Lots of details can be found on my tour page here! (scroll down to the bottom when you get there.) We are VERY excited about this one! Nice catch John. It does pay to wait. Love it ! Thank you Mark. Folks, if you’re reading this comment make sure to click on Mark’s name above his comment and check out his post from our Cuba trip. They are tremendous! I love this photograph John. It shows that a good image can become even more compelling with a little patience and instinct. By the way, that car is crazy. It looks like it can’t decided if it is a truck or a mobile home. 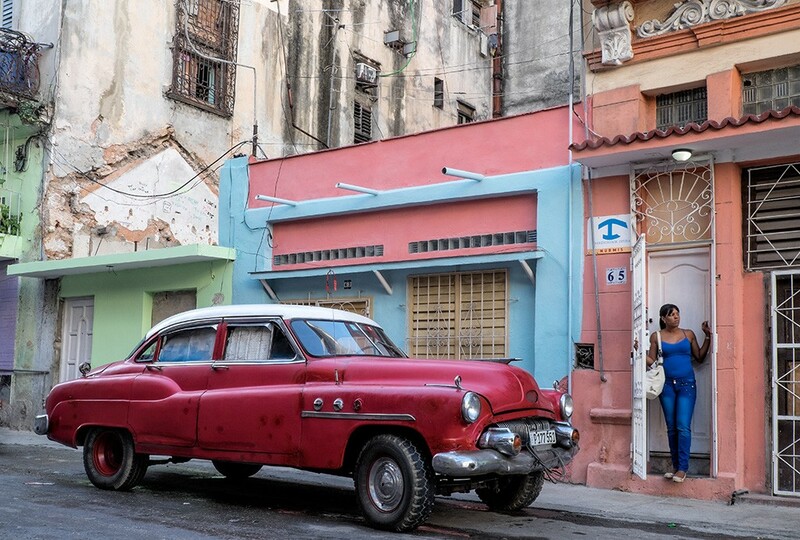 Fantastic image and a great tease for travel to Cuba. Oh yeah…and a cool car! Whether it runs or not.